12/21/2010 - Housing prices in Hanoi will still rise in 2011 and the rate of returns will remain attractive. However, the property market needs an official forecasting channel to put an end to ‘price blowing’ and sentiment-driven investment, according to many real estate experts at a conference titled "Real estate market trends in 2011 - Sharing investment experience - cooperation opportunities" recently held in Hanoi. Mr Vu Xuan Thien, Deputy Director of Housing and Real Estate Management Department, said: In 2011 and the next 10 -15 years, the property market in Hanoi, and in Vietnam in general, will continue to develop strongly because housing demand is very high, especially in big cities with high migration rates. He said property prices will still go up because the State is gradually collecting land-use fees from investors. Higher input costs will lead to higher prices. Mr Nguyen Trung Vu, General Director of Century Real Estate Company, said real estate, securities and gold are the main investment channels now. However, at present, gold and securities channels are undergoing complex developments and proving unsafe havens for investors. Meanwhile, real estate guarantees them with certain profits. This means real estate is always an attractive and safe investment channel. “But, this does not mean that real estate investment is risk-free. You will slip if you don’t employ good sense. You should look at real value before you invest and you should not invest according to herd mentality,” noted Mr Vu. Vu said, unlike in Ho Chi Minh City where investors easily get big discounts for big deals, this is not common in Hanoi, where most deals secure profit. 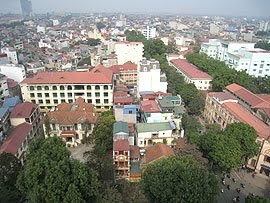 Investors in Hanoi pay little attention to the value of real estate because they are nearly certain of profit. Dr Nguyen Quang Tuyen, Head of the Land Law, Hanoi Law University, said: The Government’s Decree 71 and the Ministry of Construction’s Circular 16 have little impact on the market regulated by the supply and demand laws. Thus, excessive interventions will distort the market. Decree 71 will make the market, fundraising of investors and real estate dealings more transparent. In the future, market development will be more sustainable. However, according to Mr Tuyen, the market needs an official forecasting channel to put an end to ‘price blowing’ and sentiment-driven investment. According to experts, the Hanoi real estate market will remain active as the approval of the master development plan will provide motivation to many projects but strong waves are unlikely.